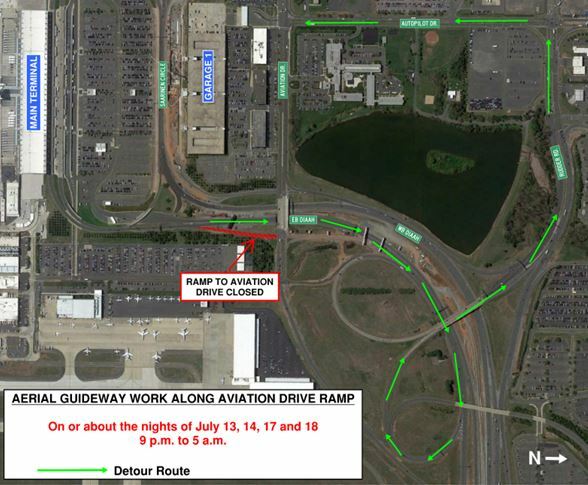 Nighttime Closure of Aviation Drive Ramp at Dulles International Airport July 13, 15, 17 and 18, 9 p.m. to 5 a.m.
July 13, 15, 17 and 18, 9 p.m. to 5 a.m.
On or about Thursday, July 14, Friday, July 14, Monday, July 18 and Tuesday, July 18 from 9 p.m. to 5 a.m., the ramp from the eastbound Dulles International Airport Access Highway (DIAAH) to Aviation Drive at Dulles International Airport will be closed due to work on the overhead aerial guideway. Traffic to Aviation Drive will be directed to the eastbound DIAAH to Rudder Road, then Autopilot Drive to Aviation Drive. Large vehicles and equipment may be entering and exiting the highway and airport roads near the work area. Drivers should exercise caution, pay attention to barriers and signage and obey all flagger instructions.